A new chaplaincy, an advisory board and resource centers located throughout the archdiocese are just a few of the changes in the Strategic Plan to improve Latino ministry in the archdiocese. “The immigrants of today continue to be an important factor of growth for this local Church,” it says in a booklet published by the archdiocese summarizing the changes. “It is therefore necessary to ensure that these brothers and sisters receive the same benefit that immigrants of old had to the sacraments, to pastoral care, and to educational opportunities, in the language and cultural custom with which they are familiar. “Welcoming our brothers and sisters arriving in the Archdiocese today is an essential sign of the universality of the Church and an acknowledgement of the gifts immigrants bring to this local Church,” it continues. Archbishop John Nienstedt will ap­point a chaplain to oversee Latino ministry in the archdiocese, according to the plan. A Latino Ministry Advisory Board also will be established to coordinate outreach to Spanish-speaking Catholics. Several parishes in the archdiocese will be designated Latino ministry resource centers “so that Spanish-speaking Catho­lics will have access to full sacramental ministry, as well as faith formation programming, and pastoral care at those locations,” the plan states. 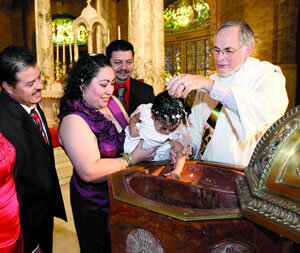 While Spanish language Masses will continue to be offered in parishes throughout the archdiocese, centrally located resource centers will provide additional services to Latino Catholics, such as retreats, assistance with social services, and access to Spanish-speaking priests for confessions, according to Estela Villagrán Manancero, a member of the archdiocesan Parish Services Team, and Deacon Ramón Garcia, who served on the Strategic Planning Task Force. At least one resource center will be located in each of the three vicariates to be established under the plan, according to Villagrán. Rather than duplicating services al­ready available through Catholic Chari­ties, the government and nonprofit or­gan­i­zations, the resource centers will serve as a “bridge” to connect people to those services, Villagrán said. The archdiocese also will continue to offer training for Latino lay people to serve in parishes, the plan states. Several parishes with large Latino populations, such as Our Lady of Guadalupe in St. Paul and Annun­ciation in North­field, will enter into formal collaboration or cluster relationships with other par­ishes, accor­ding to the plan. A Spanish-speaking staff person will be on-call at the archdiocese for a limited time to answer questions and address concerns regarding the plan. The number is (651) 291-4435.